Today I have a guest post by Jackie Morse Kessler, author of Hunger, Rage, and soon-to-be-released Loss! Ever since he first appeared in Hunger, I’ve hugely enjoyed writing Death. (Not to be confused with writing about little-d death, which, granted, can also be enjoyable to write about. Let me know if this bothers you.) He’s always been a fascinating character—timeless, ageless, a bit of a slacker. Then again, when everyone comes to you at one point or another, what’s the rush? Readers will get to see a lot more of Death in my new book, LOSS—including another side of him which may, or may not, explain a lot more about him. There are bits of foreshadowing sprinkled in LOSS for what’s to come in Breath. Many authors have tackled Death as an anthropomorphic personification—my personal favorites are by Neil Gaiman, Terry Pratchett and Piers Anthony. Who are some of your favorites? Please comment below. And if you do…you’re entered in the giveaway! 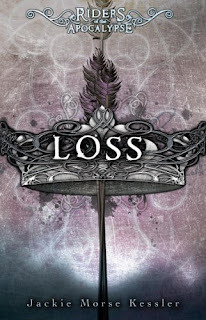 LOSS by Jackie Morse Kessler comes out March 20, 2012! GIVEAWAY: One lucky commenter below will win a small cover poster of LOSS—and will be entered in the grand prize drawing! The grand prize winner will receive signed copies of HUNGER, RAGE and LOSS—and will get to name a character in BREATH, the fourth book in the Riders of the Apocalypse series. The grand prize winner will be picked on Sunday, April 1, 2012. No foolin’. I haven't gotten to read any of these yet but they look great. The opportunity to name a character would be incredible. thanks for the giveaway! EEEK!!!! So exciting! And the cover is fabulous! Sounds interesting. I haven't read any in the series yet. Thanks for the giveaway! Loss is the one I'm more interested in, I don't know why but whenever I hear about these books it's always Death I think of! I love your Death, too. This is such a great series. My favorite death is the narrator in The Book Thief! I love this series and am excited for Loss! I am looking forward to reading this series. I've seen reviews for this series around - want to read it this summer when my schedule clears up. Thanks for the cool contest! Don't forget about Death as the narrator in The Book Thief! Good News for Alexandra Monir Fans! Meant to Be Cover Reveal!